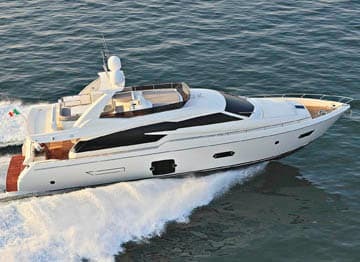 Ferretti aims for a wider audience by putting big-yacht features into its smallest “big” model. 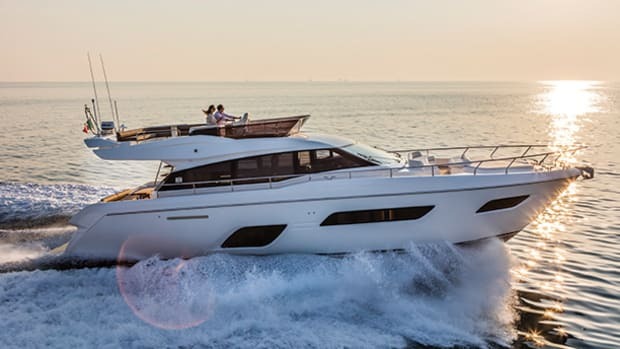 Ferretti’s new baby certainly has presence, with that big and apparently seamless saloon window, while the subtle inward curve of the superstructure introduces a sleek and sporty edge to the design. 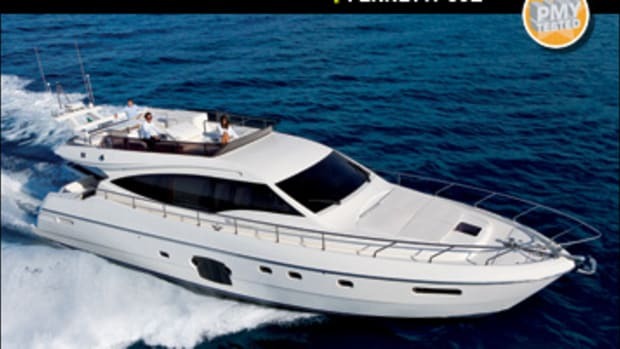 The bold flying-bridge windscreen and long overhang are vintage Ferretti, of course, but on balance you might suspect that the company is targeting new markets with this model. Younger owners, perhaps? The evidence definitely stacks up. With its gray-brown lacquer, light-toned leathers, and oak joinery, the interior design represents Ferretti at its best—modern, easy on the eye, and put together with real quality. But there’s an edge here as well. The dining table is glass and steel—cool in every sense of the word. There can be few less nautical touches than distressed oak floorboards, running athwartships, and apparently the style magazines loved it. No one over 40 reads style mags, surely? 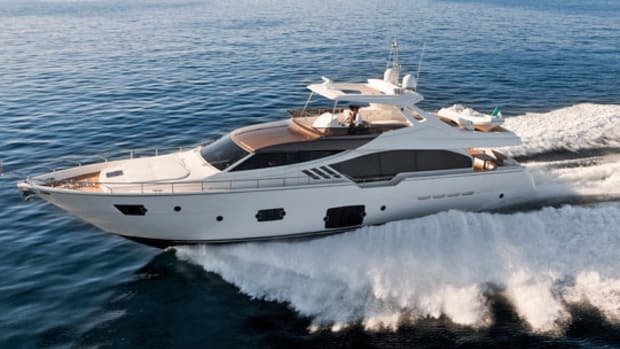 If Ferretti designers are targeting younger customers, they’re pushing the right buttons. Another decision they faced was whether to make the 720 the smallest of their big-yacht range or the biggest of the small ones. It’s clear which they chose—the question is whether these combined aims are compatible. 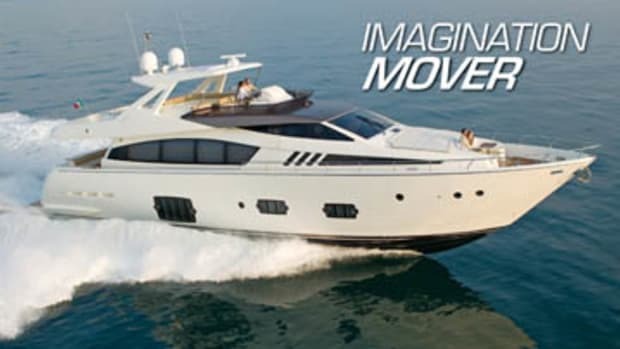 Enclosed wheelhouse, discrete galley, crew dinette, athwartships dining table—all these are big-yacht features. But space around the table is tight, and sightlines come to a sudden halt at the galley bulkhead. The crew dinette, just inside the wheelhouse door, is a great feature but separating crew and guests would work better if guests didn’t have to pass through the wheelhouse to get to their cabins. That superstructure tumblehome is also interesting. Clearly designed to sport-ify the exterior, in which it succeeds admirably, the effect it creates inside is a little cramping: The floor is expansive and the windows huge but the main deck doesn’t feel especially spacious, and that inward curve is a contributory factor. The effect is even more pronounced when the forward door is closed. 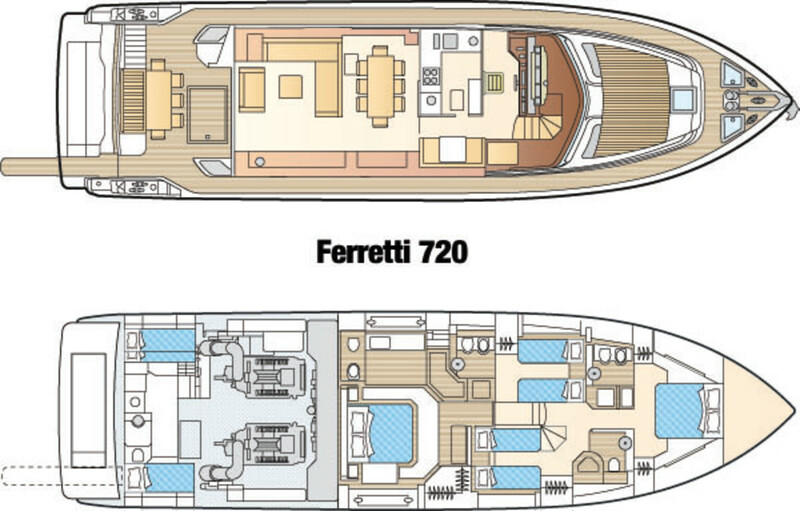 Yet the 720 has the longest main deck, transom to windscreen, of any yacht in its class. She just doesn’t look it. Down below, normal service is resumed with a conventional accommodation layout: a superb amidships owner’s suite with a big hanging locker, and a bathroom occupying the whole port side, complete with a risqu, see-through shower. The VIP cabin in the bow is less spacious, but practical and comfortable, with headroom a generous 6&apos;7"—slightly more than the master. Of the twin-berth guest cabins, grab the one to port if you can, as you’ll share the other one with the underside of the stairs. 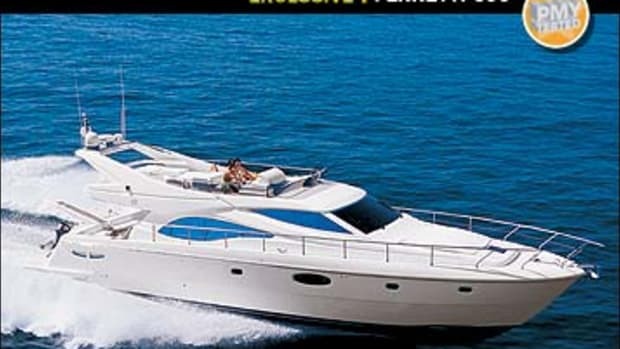 Out on deck, the 720 also feels more like a traditional Ferretti. 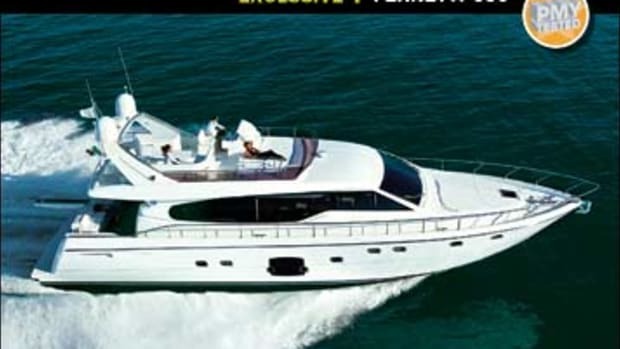 The flying bridge is a tennis court, with a vast sunbathing area forward of the helm, a big table, a bar, and room aft for a PWC and its davit. The optional bimini folds neatly into the radar arch while the main tender is stowed below, on the platform. Side decks are substantial—more than 18 inches wide with tall, handrail-topped bulwarks—while the quality and heft of the deck fittings are well up to the yard’s exemplary standards. Access to the crew’s quarters is via the cockpit seating. This boat had the optional second crew cabin, bringing the number of berths down here to three. While I met the 720 before the summer season was in full swing, the weather held fair. Ferretti bade its guests goodbye as we set off for the company base at La Spezia, about 40 miles down the coast, past some of the most interesting scenery in the Med: the five villages of the Cinque Terre, clinging to their steep hillsides over the sea. 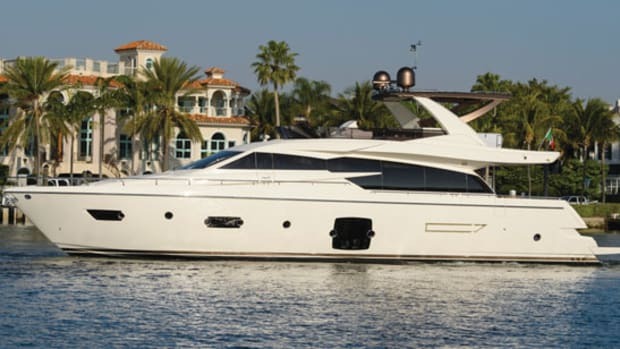 The 720 posted respectable acceleration times from a standing start: 25 knots in just over 30 seconds is fine for a motoryacht that tips the scales at around 50 tons in cruising trim. Equally fine was the 720’s handling, which gets an electronic assist in the form of a ZF SteerCommand system that imparts feel as well as self-centering, like a car. More importantly, it controls the rudders independently and so ensures the correct correlation between rudder angle and hull velocity. Straight-line speed has never been an issue with Ferrettis, but crisp, sporty handling has not generally been its boats’ strongest suit. With this system, its boats can look rivals in the eye. 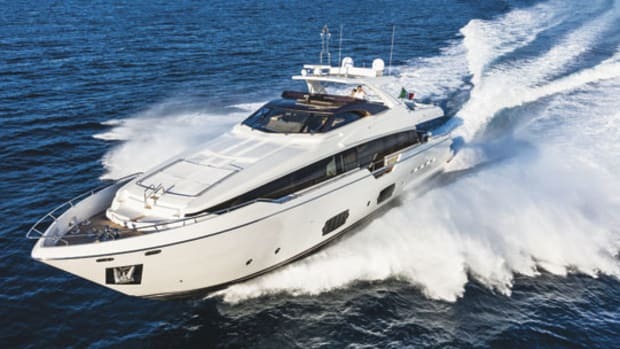 In pure engineering, though, Ferretti has always shown the way. 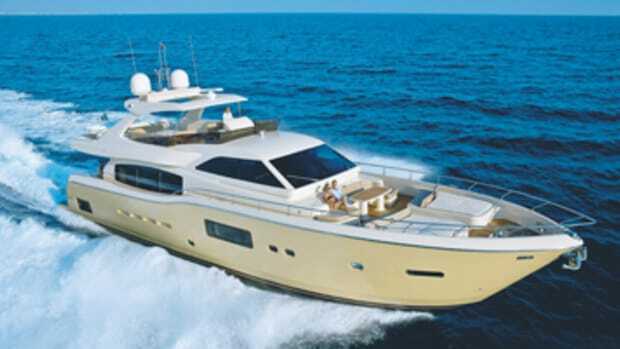 The 720’s engine room is big—bigger than the owner’s suite, which is saying something—and there is room inside for all the noisy ancillaries: gensets, pumps, watermakers, and air-conditioning, with the huge fuel tanks mounted across the forward bulkhead to provide further insulation between hard metal and soft furnishings. The layout here has been designed to make removing the engines as straightforward as possible. As the Cinque Terre villages slipped by on the port side, gazing down from their lofty perches against a cloud-flecked sky, a lightly corrugated sea gave the 720’s hull little to think about. At the clifftop church of San Pietro we turned east into the Gulf of La Spezia. In flatter water the GPS showed over 34 knots (39 mph) on a two-way average—loaded as we were, no mean speed—and we turned for home. 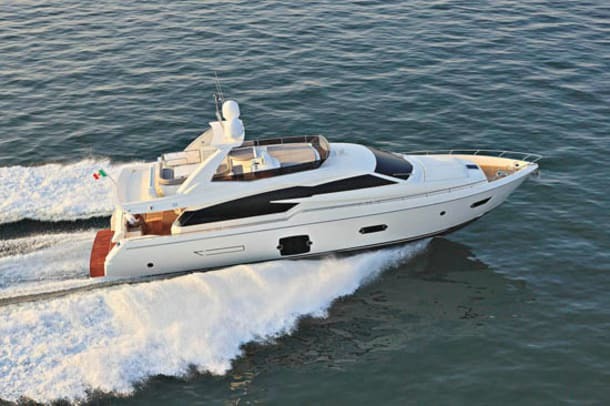 Ferretti is not a high-volume builder, but it has always built high-volume boats. The 720 is purely that—a glance around the engine room tells you so. But it doesn’t feel big either. Some might say that squeezing a big-yacht interior into a sporty flying-bridge cruiser was always going to be a risky strategy. But is it risky or bold? Time will tell.